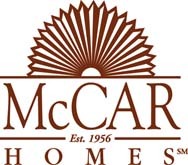 McCar Homes is offering buyer insurance in their Carolina communities. Called the Assurance Guarantee, it allows homeowners to feel confident that they made a sound investment and the right choice for their families. The Assurance Guarantee ensures that homeowners receive the lowest base price at the time of closing. Homeowners also receive a 90 day interest lock and a 15 year warranty on their home. Every single luxury home built by McCar is a high-quality house that you can be confident will last, and this warranty shows that they truly stand behind their homes. The warranty covers any constructional defects as well as all structural elements. How often does a company come along that really allows you to buy a new home with complete peace of mind? As always the McCar communities are top of the line with incredible amenities to give you and your family a place to play and grow together. This entry was posted in Charleston new homes, Charlotte new homes, Columbia new homes, Greensboro new homes, Greenville new homes, New Home News, North Carolina, Raleigh new homes, South Carolina, Winston-Salem new homes and tagged Assurance Guarantee, Carolina, Charlotte new homes, Greensboro new homes, Grenville new homes, luxury home, McCar, new home, Raleigh new homes, warranty on July 12, 2008 by Carol Morgan.